Anyone who has ever lived or even just been in Houston for one hour during the summer knows the heat and humidity horrors we go through. It is HOT. And HUMID. Thankfully, we love air conditioning and have it blowing super cold throughout every building. It's so cold inside and so muggy outside that my sunglasses and phone will literally fog up when I move from indoors to outdoors. But enough about our summer weather. 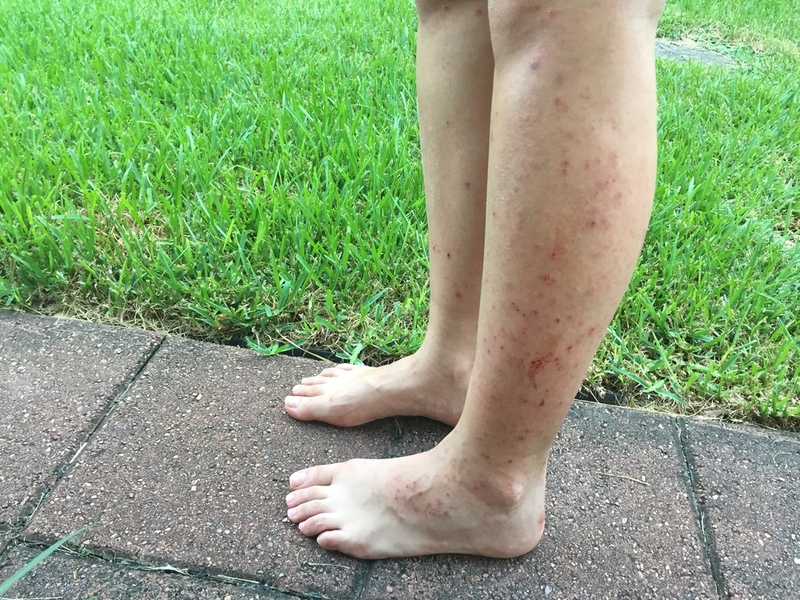 What does it have to do with eczema? Everything if your skin is flared up and needs to be covered. Think long sleeves and pants during the summer. It's not ideal, but sometimes it's preferable to exposing flared up skin or bloody scabs. My legs and feet still look horrible after months. I've never had anything like this - it still looks like a ton of bug bites, but they won't heal, even with steroid cream. And it's so itchy! I know it's not just in my head, because I was with my two little twin 4-year-old nieces a few weeks ago and they asked me what was wrong with my legs. Little kids are super honest! Thankfully, I am in LOVE with wearing colorful tights and typically wear them year round, even when my legs are healthy and beautiful. The cold air conditioning throughout the city makes it reasonable to do so. Plus, Houstonians don't typically spend much time outside during the summer - it's too unbearable! Most importantly, eczema sufferers should stay out of the heat to avoid intensifying or causing flareups. This is me last week doing my belly photos while 31 weeks pregnant. The tights were perfect for the outfit! Still, I'm fine bearing my legs when I'll be outside for awhile or just to be more comfortable. For example, in a few weeks when I get into my bikini, I'll be that pregnant chick with the big belly ... and the eczema-covered body. I'm sure the belly will steal the show, though!